Linn brings Exakt technology to its Akurate range | What Hi-Fi? Linn has today announced the imminent arrival of its Exakt technology in its Akurate range. We reported on Exakt's debut in the Klimax range, but its appearance at the Akurate level makes the technology more affordable than before. Everything's relative, of course: an Akurate Exakt system, comprising an Akurate Exakt DSM (a digital streamer/pre-amp) and a pair of Exakt Akubarik floorstanding speakers, will set you back £25,500. 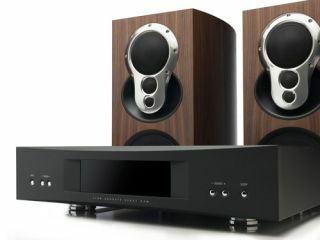 Or if you already have a pair of Akubarik Activ speakers, there's an upgrade to Exakt specification available for £14,000. The Exakt philosophy insists on digital music files (the bigger the better, of course) being kept in the digital domain absolutely as long as possible. So the Akurate Exakt DSM connects to its partnering Exakt Akubarik speakers via CAT5 (which Linn is calling Exakt Link). Once aboard the speakers, the signal visits the Exakt Engine digital sound-processing. The Exakt Engine is designed to eliminate the magnitude distortion and phase distortion of analogue speaker crossovers, correct for the manufacturing tolerances of each individual drive unit, and to allow the dealer/installer to optimise the speakers both for the environment they're to be used in and their position within it. From there the signal undergoes a conversion to analogue and is amplified on its way to the speaker drivers. This reduction in the number of 'lossy' stages in the audio path, and the dramatic reduction of the length of the analogue signal path, offers obvious benefits. And the sophisticated sound processing going on inside the Exakt Engine should allow optimum audio performance regardless of the room the system is in. Linn, of course, made its name with the LP12 turntable, so the Akurate Exakt DSM will accept an analogue signal, convert it to 24bit/192kHz digital information and then deal with it exactly as it would a signal that originated in the digital domain. The Akurate Exakt system goes on sale on April 22nd, when Linn's website will carry full technical specification and a list of launch events and demonstrations.